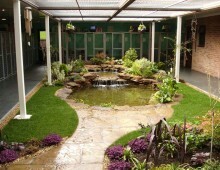 Our cattery is purpose built, of brick construction in a court yard arrangement. Accessible only through the reception area it provides a safe and secure environment for your cats stay. The pens are located around the outside of the courtyard, looking upon the central ornamental garden and fish pond. The gentle flow of the waterfall creates a soothing and relaxing atmosphere, whilst the open court yard provides fresh air at all times. Each individual cat pen has a heated igloo lined with a freshly laundered fleece that provides the warm, cosy home so sort after by cats. 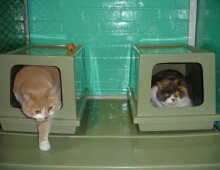 Each pen can accommodate two heated igloos and can board up to three of your cats together. 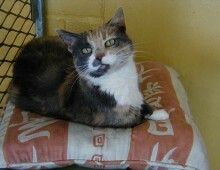 Our pens have plenty of room for you to bring along your cats favourite toys, bedding and scratching post. Your cat will receive individual care and attention to ensure that their stay with us is as comfortable and enjoyable as possible. During the morning cleaning and feeding routine your cat will receive their daily health check to ensure that they are fit and well. Throughout the day they will receive further personal love and attention which includes cuddling, stroking, playing and brushing. We will feed your cat according to it’s age and condition from our extensive range of Royal Canin premium dry foods and Whiskas and Felix wet foods. If you prefer to bring your cat’s own food, we will be happy to feed this to your instructions. If your cat is receiving medication our experienced staff will administer this as instructed by your vet.